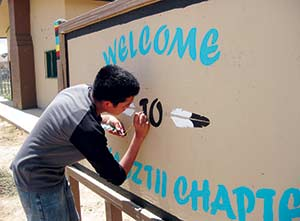 "Chancelane Begay, 16, a participant in the Summer Youth Employment Program, paints a welcome sign in front of the Tsé Al Náozt’í Chapter House" by Cindy Yurth. All rights reserved. Use with permission only. 2014 Tsé Al Náoztii Struggles with Nature, Internal Conflict. Navajo Times. http://navajotimes.com/news/chapters/073114tes.php, accessed July 13, 2016.